Roadworks Ahead Cone Sign 750mm. Class I reflective face and fully comply with BS8442. 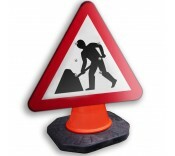 ..
Road Narrows Nearside Cone Sign 750mm. Class I reflective face and fully comply with BS84..
Road Narrows Cone Sign 750mm. Class I reflective face and fully comply with BS8442. Ma..
Directional Arrow Left Cone Sign 750mm. Class I reflective face and fully comply wit..
Directional Arrow Right Cone Sign 750mm. Class I reflective face and fully comply with BS..